Stewartry Sharks hosted Moffat, Newton Stewart and Wigtownshire. Around 120 P1-P7 aged boys and girls recently took part in a great morning of rugby in ideal conditions. 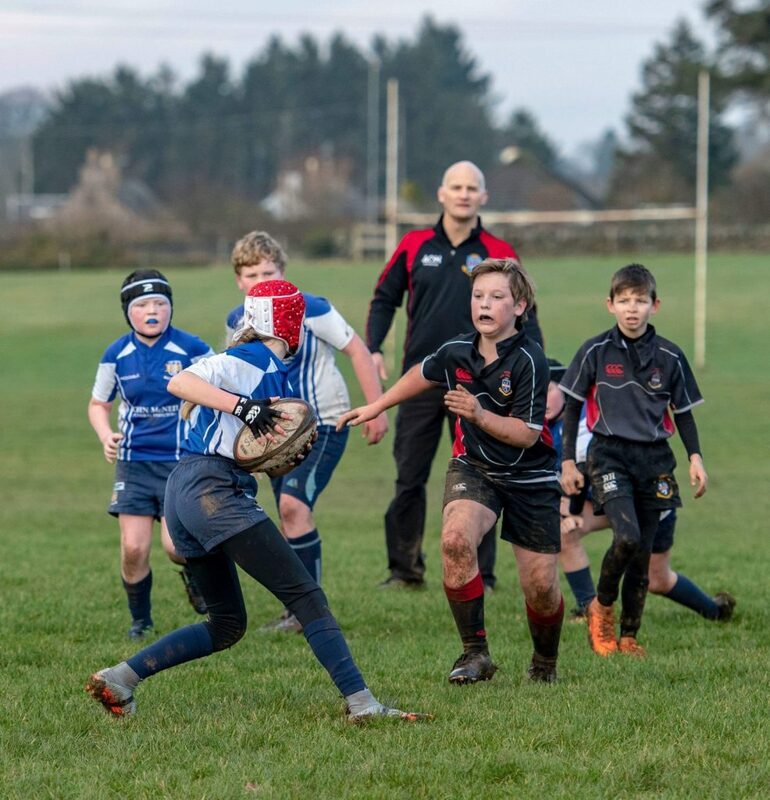 A strong turnout of eleven boys welcomed Newton Stewart, Moffat and Wigtownshire to Greenlaw on Sunday. Whilst the necessary rotation may have hindered team cohesion, all of the boys had the opportunity to display their individual skills. Ciaran, Mitch and Sam all showed that they can cut through the opposition without needing a second invitation, scoring lots of tries in the process. I don’t know where they learned their footwork; it certainly wasn’t from this former prop. Alexander and Rhys made some telling turnovers, pouncing on a few dropped balls which allowed the team to turn defence into attack. A combination of direct running and good angles from Coby, Rory and Will helped put some more scores on the board, both for themselves and for their teammates. In defence, Gregor, Jorah and Matthew showed good line speed and made some important tackles. There was some uncertainty about final scores; but if Stewartry didn’t win all of their matches, they were certainly for my money the dominant team in each of their games. If we can harness the individual talent to a team ethic, the boys will continue to be a match for anyone. P4 and P5 minis team finished victorious,having beaten Newton Stewart 7-5, Moffat 12-9 and Wigtonshire 14-5. Well done Sharks great effort. P6/7 age group saw Stewarty kick off against Wigtownshire playing two halves of 10 minutes each way. The first half saw the young Blacks roar into a 6 try to 2 lead with some great rugby played. In the second half Stewarty seemed to take their foot off the gas and let the Shire back into it and were lucky not to throw away their comfortable lead with the visitors coming back well to just fall short at the end with the Sharks seeing the final whistle just one try in front. Next up for Stewartry were Newton Stewart and some great rugby throughout saw the Sharks run out comfortable winners. The pick of the tries being a kick and chase from their own try line followed by several good phases to make the final few yards and a touch down for young Callum. The last game of the mini tournament saw Newton take on Shire with a hard fought game ending all square. Thanks to all who made the journey to Greenlaw for what was a great day of rugby in near perfect conditions.